A 20-year-old Colleyville man with a “zest for life” died last month in Lubbock of a fentanyl overdose, the Lubbock County Medical Examiner said. Jameson Hess’s death on Sept. 9 is one of at least five in Lubbock under investigation by Drug Enforcement Administration agents following raids on two suspected fentanyl labs there last week. Three people were arrested. Federal drug agents said a small amount of fentanyl can kill. The drug is a potent synthetic opioid and sometimes is mixed with heroin. "I am so scared,” said Jameson’s mother, Jennifer Hess. “I can't even believe there's something that potent out there." Hess said her son, who attended Keller High School and was the middle of three brothers, had a “complete zest for life” and excelled in sports, especially wakeboarding. But around age 14 or 15, he started to experiment with drugs, she said. 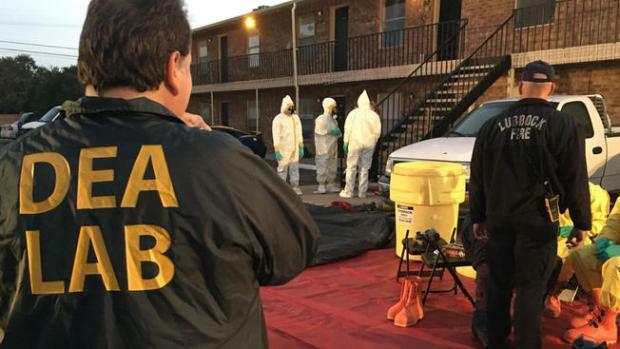 Federal agents in hazmat suits raided two locations in Lubbock Thursday, finding evidence they say of a drug so dangerous even small amounts can kill. By 18, he was using Xanax and pain killers, she said. "This was a slow gradual process and we could see a change in his personality,” she said. Jameson Hess’s parents, who both work in the television advertising business, put him in a rehabilitation facility in Stephenville. "And then we found out he was smoking heroin,” Jennifer Hess said. Last month, on her 50th birthday, Jennifer Hess’s phone rang early in the morning. She thought it might be her son, who was living with a friend in Lubbock, calling to wish her a happy birthday. Instead, it was a doctor at a Lubbock Hospital. "Worst call of my life,” she said. "(The doctor) got on the phone and said he was dropped off. He barely had a pulse. They tried to resuscitate him for several hours." Jennifer Hess now wonders if the fentanyl bust in Lubbock last week is linked to her son’s death. The DEA is investigating. "It's a nightmare that I can't wake up from,” she said. "I just had to carry his ashes in the other day, just like I held him to my belly when I ran out to give birth to him. It's sad."